Yeast is probably the number one most important ingredient in baking. Especially with breads and other doughs, yeast is what makes your baked goods rise. You may not exactly understand how that all works, but what is important to know is that without live or active yeast, your bread will probably not leaven and reach its full height, and your bread will not reach its full potential. What you may not know is that yeast is often sold as “active” or alive, and it can go bad or die over time. So why is it important to use active yeast? And how can you tell if your yeast has gone bad? We have put together a handy guide to tell you all about active dry yeast and how to get the most height and fluffiness out of your baked goods. What is the Point of Yeast? Great question. You have probably heard that yeast is what makes your bread rise. But how exactly does that happen? There are fermentable sugars in the yeast that are broken down during the kneading process. This releases carbon dioxide, which gets trapped in the dough, and causes it to expand (and therefore, rise!). So, because there are literally gasses trapped inside the matrix of the dough, any products leavened with yeast have that light, airy texture to them that makes bread so delicious. Yeast also gives off that typical “bread” flavor into the dough, with most of the flavor being released in the crust and diffusing into the rest of the bread. Without yeast, your breads and pastries would be flat and not have that flavor that makes bread so delicious. During that fun yeast fermentation process we described above, the yeast emits gasses. Okay, we said that already. But what we did not tell you was that it emits those gasses as a byproduct of eating (yes, eating) sugars and other parts of your dough. Basically, yeast is a live microorganism that feeds off of sugars. This may sound really creepy, but just bear with us. Without being “active,” the yeast cannot eat the sugars, and therefore you will not get those gasses which are the key to the entire bread-making process. Thus, we have to make sure our yeast is still alive before we start making our dough, so that we get the maximum rise out of it. Before the 1850s, yeast was actually gathered from the air around us and available only in a sourdough culture, which is why sourdough bread was so popular. 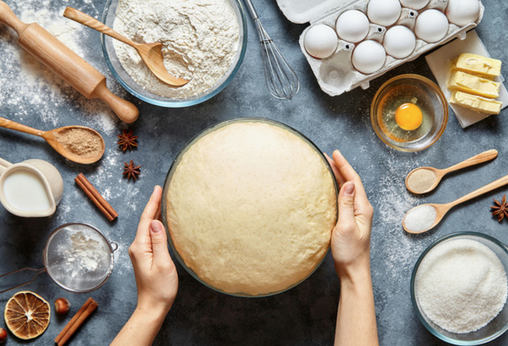 Today, things have changed a bit, and you can get yeast in a few different types—mainly dry yeast, compressed or cake yeast, or instant or quick-rise yeast. The dry yeast will most likely come in small pellets, like our Bob’s Red Mill Active Dry Yeast. Fresh yeast is kind of like a paste of sorts, and instant yeast will look more like a ground up powder. Dry yeast is what we like to use, and you have to proof it before you use it to ensure that it is still active and eating away in order to produce the right gasses for leavening. If you proof instant yeast, however, you may accidentally activate its rising tendencies too early and waste the whole batch—so only proof dry yeast or compressed yeast. Proofing, or what used to be referred to as “proving” yeast, is a process by which you can determine if your yeast is still in a good place to be doing its job—namely gobbling up all those sugars in your recipe and spitting out carbon dioxide that you need to leaven your bread. If your yeast is “dead” or “inactive” then you will need to get new yeast—there is no way to revive it or liven it up again once it goes bad. Dry yeast can last up to 12 months, but there is no guarantee. We recommend storing it in the refrigerator, especially after it is opened. The only true test to see if the yeast is still alive, however, is to proof it, no matter how long it has been in the pantry or fridge. It only takes a few minutes and is way easier than making your entire dough and finding out the yeast is dead the hard way. We call it the hard way because that is what your bread will be without live yeast—hard and flat. Proofing yeast is basically just ensuring that it is still eating, which is actually easy to observe with your eyes. No special tests are needed, you just need to basically create an environment in which yeast is typically prone to start working, and see whether it does or not. Yeast likes warm environments, but too hot will kill them. The environment should also be moist and full of yummy sugars to be the ideal environment for yeast to start showing you what they’ve got. Take a small amount of the yeast, and measure out the appropriate amount of water. Mix the two together, then heat the water to about 80 degrees Fahrenheit. Add a little bit of sugar for a little yeast feast, and wait. The yeast should start eating the sugars, in which case you will start to see bubbles from the carbon dioxide that is forming. If you see the bubbles, then it is safe to assume that your yeast is still alive and kicking—go ahead and make your dough. On the other hand, if no bubbles form, then you may have dead yeast, and you should definitely get a new stash before baking for the best results. Do I Really Need to Proof? There are definitely some different schools of thought on this. Most yeasts these days last longer than they used to, so if you bake with yeast often enough then you are most likely fine. Especially if you go to a reputable store with decent turnover, and if you are not near the listed expiration date, you should be fine. If your yeast sits on a shelf and rarely gets used, on the other hand, then it will probably benefit you to do a double check before dumping it in your dough. It really is up to you on your preference, but we prefer taking a few minutes to proof over dumping an entire batch of dough in the end. You may have seen instructions somewhere for dissolving yeast, or activating it. If you end up using dry yeast, you will notice that it comes in little pellets. The pellets are perfect for longer shelf life, but need to be activated a bit when you do want to use them finally. These pellets are typically too large for the yeast to be fully dissolved in the kneading process, so you will need to help it along. This just means that you need to dissolve the yeast in water before adding it to your dough. There is no special trick to this, but it is different than proofing your yeast, so you will need to do both processes separately. You will probably need to dissolve your proofing yeast in water before proofing, so that it is able to show full activity in the water once you add the sugar for it to munch on. Cake yeast seems like it would be used in cakes, but that is not the case. Cake yeast is also sometimes referred to as compressed yeast, and actually comes in a “cake” of sorts that has the consistency of a paste. It goes bad faster than dry yeast, but you can store it in the freezer or refrigerator for several months. When using cake yeast, you will find that it becomes active faster (as it does not need to be activated) and it stays active longer than dry yeast, giving you even more gasses and a lighter, airier bread product. You should give it a full 24 hours to defrost before using it, and interestingly enough, compressed yeast tends to have a more mild taste to it than dry yeast, so it is perfect for sweet, airy breads like Italian or French breads. Whether or not you are 100% on the science of the yeast organisms (we do not even like to think about it too closely), you can physically see the difference between working active yeast and dead yeast in a bowl when you proof it. This proofing gives your bread the best advantage during the rising process, and allows you to wow your family and friends with the fluffiest home-made bread they have ever enjoyed. We always recommend proofing your dry active yeast, and testing out all of the above tips and tricks. Happy baking, everyone!